We all receive loads of Spam and Marketing Emails, but one of the unforeseen side-effects of setting up a web design company, is that as soon as you start registering domain names for clients, you begin getting lots of emails offering you websites to go with those domain names. Now usually I read these with Interest, as Scruffy Dug is a small company and its useful to see what the market is saying to potential customers so we can compete on level ground. Now, this morning I received the following email, and while it’s actually fairly competently put together (I’m no expert, and I’ll bet a professional copy writer could have a real fun time with what I write), it’s got a number of glaring errors, have a quick read through and join me below for my comments. We are a Digital Marketing Agency with our primary focus on SEO, Web Design and Development. Would you like to increase on targeted high quality visitors to your Website every day? I just tell you that we are offering our Digital Marketing Services on Affordable prices and promise to deliver what we commit. We can help people find you on Google and other search engines through Digital Marketing (SEO + SMO). I am sure that you will get good experience with us. Social Media Optimization- SMO (Facebook, Twitter, LinkedIn, YouTube and MySpace etc.). Please let me know if you need further information. We look forward to helping you grow online! Please share a little brief about your requirement and leave us your phone number and website address, we will review your requirements and further discus it over a call with you. Okay, so the first thing is, why is Jassica putting her name in Bold right there at the top? It’s obvious that her name is important, but I’m afraid I’ve never heard of her and highlighting it only highlights the fact to me that I’ve never heard the name Jassica before, is it a real name? Or is this one of those situations where a company in India has chosen an anglicised name and made a mistake? I don’t know, and that’s what’s sticking in my head, not anything else she says. In fact, doing a search for Jassica’s name and “digital marketing” brings up no results, and Google automatically changes her name to Jessica, even after telling it that you’re definitely searching for Jassica, but lets carry on. She says they’re a digital marketing agency, but what are they called? She never mentions who they are. The email was sent from a GMail account, so not even the sender’s email address helps me. Who are this mystery Digital Marketing Company? Giving me a name would allow me to just google and find out more, now you’re making me work, sending an email to find out, where I could just google “digital marketing company” and see who comes up. The grammatical errors go without saying, although I’m hardly in a position to speak, but give the impression that english isn’t the writers first language. While their list of services seems pretty standard, it doesn’t seem sure who it’s talking to. Are you speaking to a professional who’ll know what PPC (Pay Per Click) is? If you are, why do you define what SEO (Search Engine Optimisation) is? Or were you speaking to non-experts and just forgot to define PPC? The list of Social Media seems just a little off. If you’re listing all Social Platforms, then where’s Instagram and Tumblr? If you’re just listing the popular platforms then what the hell is MySpace doing in there? She again goes a little crazy with the bold text, putting three full paragraphs in bold, rather than just using it to highlight something, so reading through I’m not entirely sure what I’m supposed to be paying attention to here. This is made worse by the fact that two of these three bold paragraphs are asking me to do different things. Am I supposed to be replying to get the sample work, testimonials, quotations and price list? Or am I supposed to be sending a brief, my web site url and my phone number? I’m confused, and the second one seems like a load of work when I don’t even know fully what you can do for me! Anyway, just thought I’d point out a few rookie mistakes that Jassica made, and hopefully learn from them myself. 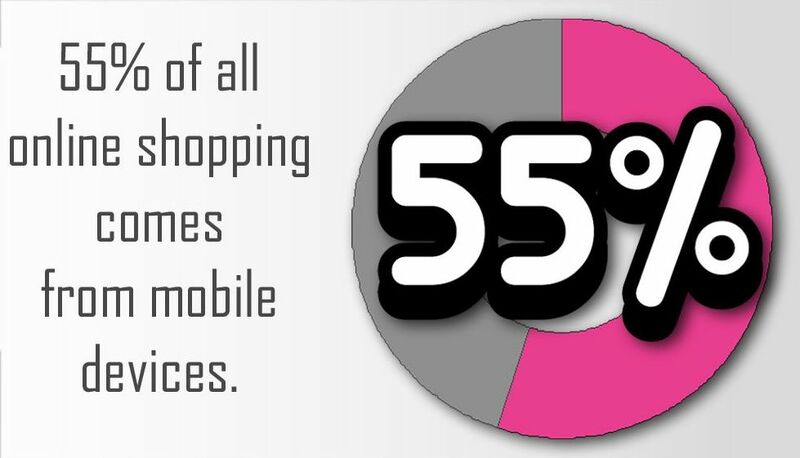 55% of all online shopping comes from mobile devices.